The Primary Classroom curriculum consists of a three year cycle for children ages 3 – 6. Hours for Primary Half Day classes are 8 AM– 11:30 AM. Hours for Primary Full Day classes are 8 AM – 2:30 PM. Daily enrichments include: French, Spanish, Music, Art, Yoga, Gardening, Cooking, Coding and Robotics. The Primary classrooms at Montessori Kids Academy are peaceful, carefully prepared, and beautiful. Children ages three to six years learn with multi-sensory, hand-on Montessori materials. The teachers are all Montessori trained and certified, with many of the assistant teachers either in the process of getting their Montessori credentials, or Montessori trained as well. Students are guided on an individual basis through the vast curriculum, based on their needs and progress. Children develop independence, self-motivation, and confidence while becoming responsible members of the community around them. Primary classrooms are joyful and calm environments for the students, and the teachers interact with them in a positive manner, modeling kind and respectful behavior. Each child is treated as a unique individual and is able to progress through the Primary curriculum at his/her individual pace. Students are given individual presentations of new lessons and then have the opportunity to practice the new material as often as desired until mastering the lesson. In addition to academic excellence, Primary classrooms focus on social, emotional, and physical development of children. The teachers are Montessori Kids Academy want to not only develop students’ academic ability, but also kindness, leadership, confidence, responsibility, curiosity, creativity, and self-direction. Academically, the Montessori classroom focuses on five main areas: Practical Life, Sensorial, Language Arts, Mathematics, and Culture Studies. Please click here for an overview of the Primary Curriculum. Practical Life activities are introduced to the children so that they are equipped with daily practical life skills. The activities are simple, concrete exercises that are familiar to the children because they mimic what they see others do in daily life routines, such as pouring milk from a pitcher, spooning vegetables from one bowl to another, threading beads, sweeping the floor, buttoning a jacket, etc. These activities are designed to provide real-life experience that assist the children’s coordination and concentration, as well as developing fine motor control. Practical Life materials develop independence, concentration, self-control, and physical coordination of the children. When children are able to perform these exercises, they also develop self-respect and self-esteem. Children also learn social skills and awareness that enables them to interact, cooperate, and solve problems with other children as they are working together in the classroom environment. Young children primarily learn about the world around them through the constant use of all their senses. The Sensorial materials and activities are designed to develop the five senses of the children to aid and heighten their senses for learning by isolating qualities such as color, shape, texture, size, weight, sound, smell, and dimension. The children’s manipulation of the Sensorial materials such as differentiation, independent, judgement, estimations, exactness of perception, and perception of similarities and differences which also assist in laying the foundation for future Mathematics work. Oral language, reading, and writing skills are developed in this area. Through the use of multi-sensory materials, children progress from learning sounds to reading books, from writing letters to writing stories. At first, students learn the phonetic sounds through various activities by recognizing and associating letters with their sounds. Then they begin blending letters to read, blending words, progressing to consonant digraphs and vowel digraphs, before moving to the introduction of early grammar, reading comprehension, and creative writing. Children learn to read and write in both print and cursive. The goal of the language arts area is to not only teach reading, but also instill a love of reading and writing. 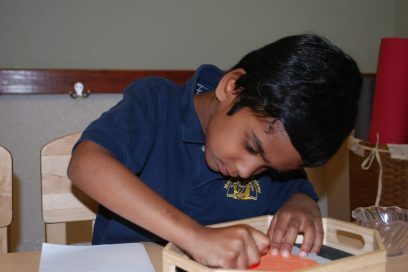 Montessori math is a hands-on, concrete approach to learning about mathematical concepts. Students are able to experience math in a multi-sensory manner, which helps them to develop a strong foundation for learning abstract math concepts. Instead of rote memorization, children develop understanding. Teachers present small concepts separately and sequentially, building on the child’s mastery. Some examples are Sandpaper Numerals, Spindle Box, and Golden Beads. The Montessori Mathematics materials serve as a concrete method where the children learn the concepts of mathematics by working on tangible mathematics equipment. They provide the children with a clear understanding of the four operations (addition, subtraction, multiplication, and division), fractions, place values, and patterning. Children gradually progress on to the abstract level of mental calculations and problem sums to prepare them for their elementary years. Culture Studies provide the foundation for children to learn about the world around them as it encompasses Science, Geography, Botany, Zoology, and History. The Culture materials and topics which the children manipulate and discuss in the classrooms develop their understanding of the world around them. Children explore the different areas of Culture Studies with a wide range of materials, learning an extensive vocabulary, and widening their understanding of the world around them. Geography materials include the puzzle maps and the land and water forms, as well as a wide range of materials for the study of each continent, its people, animals, cultures, and biomes. Science materials include the solar system, magnetism, the human body, plant, and animal studies. Children enjoy weekly art lessons with the art teacher. The art curriculum includes learning about different artists and art styles, as well as art techniques and mediums. The students have a variety of art projects to help with the development of creativity and self-expression. The curriculum for Primary also includes foreign languages (French and Spanish), group times for stories and music, cooking, gardening, and daily playtime. Kindergarten students experience their first field trips away from the school and participate in a special daily group time after lunch. They have additional art, music, and PE times each week with Kindergartners from other Primary classes. Children must be 5 years of age by October 1st in order to begin kindergarten.